Apple is holding a media event today at its Town Hall auditorium on its campus in Cupertino, California, where it is set to introduce the next-generation iPhone. The event is scheduled to kick off at 10:00 AM Pacific Time / 1:00 PM Eastern Time. Apple will not be providing live video coverage of the event to the public, but a number of news sites will be on hand to provide text and photo updates, and we're including links to several of them here. We will also be updating this article with coverage as the media event unfolds and issuing Twitter updates through our @MacRumorsLive account. Separate news stories regarding the event announcements will go out through our @MacRumors account. 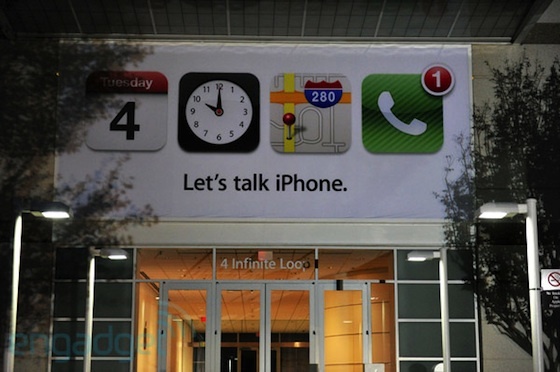 - Apple to Release iPhone 4S with New GPS Features? - No LTE or WiMax for New iPhone, Launch on October 14th? - Apple to Offer iPhone 3GS Free on Contract? - Media attendees are seated and waiting for event to begin. - Tim Cook on stage, welcoming attendees to the campus. Going over history of Town Hall auditorium...original iPod, MacBook Air launched here. - Today is about innovations in software and hardware. - Apple has tremendous momentum. Highlighting retail stores. Shanghai store saw 100,000 people in opening weekend. Hong Kong had more opening day Mac sales than any other store. - Brief video of the new Shanghai/Hong Kong store openings. - Six stores in China with a lot more to come. 357 total stores in 11 countries. - Walking through each of Apple's four product areas. Starting with the Mac and Lion. - 6 million copies of Lion sold so far...up 80% over Snow Leopard. Took two weeks to reach 10% of installed Mac base. Windows 7 took 20 weeks to reach 10% of Windows base. - 23% year-over-year growth for Mac, 58 million users. - Now talking music. Market share has been above 70% for very long time. iPod has 78% share now. Over 300 million iPods sold. - iTunes Store now has 20 million tracks, with over 16 billion downloads. - Now iPhone. 125% year-over-year growth. iPhone 4 responsible for over half of our total iPhone sales ever. #1 smartphone in the world. But despite success, still only 5% of worldwide mobile phone market. - Now iPad. Highlighting customer satisfaction ratings. iPads showing up everywhere...every U.S. state has at least a pilot program for schools. Higher education too. Airplane cockpits. Hospitals. Momemtum in consumer, enterprise, everywhere. - iPad has 75% market share in the U.S.
- Now over 250 million total iOS devices sold. - Scott Forstall on stage to talk about iOS. - iOS #1 mobile operating system with 43% of market. Apple has paid out $3 billion to developers. 18 billion App Store downloads. - Talking about new Cards app to order greeting cards. Apple will print with your photo/design and even mail them. Cards will be free download on October 12th. Cards are $2.99 mailed in U.S., $4.99 anywhere in the world. - Game Center. 67 million accounts so far. Adding achievement points, profile photos, etc. - Safari, Mail, PC Free...basically recap of WWDC. - iOS 5 debuts October 12th. - Eddy Cue on stage to discuss iCloud. - Integrated right into apps, everything happens automatically. Discussing iTunes in the Cloud...download and redownload iTunes music purchases anytime on any device. - Photo Stream, Documents in the Cloud. Daily backups of contacts and calendars across devices. - Find My Friends. Can easily see where my family is at Disneyland or whether my son made it to school today. Can set time period to limit location sharing. Simple privacy controls. - iTunes Match. Scan and match entire library to iTunes catalog. Create and edit playlists, updated across devices. $24.99 per year. 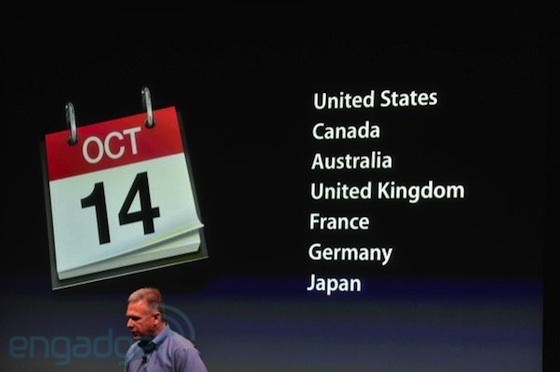 - iCloud launches October 12th. iTunes Match at end of October in United States. - Phil Schiller on stage to talk about iPod. Updates to two of the lines today. - iPod nano update: Easier to navigate with large icons, swipe between them. Improved fitness tools...track walks and runs right out of the box. 16 new clock faces. - $129 for 8 GB, $149 for 16 GB. Available today. - iPod touch update...will run iOS 5. Some features like iMessage and Game Center improvements make sense for the touch. - iPod touch now in black and white $199 8 GB, $299 32 GB, $399 64 GB. Available October 12th. Shuffle still sticking around at 2 GB/$49. - iPhone 4S. Outside the same, inside all different. A5 chip inside, dual-core graphics up to 7x faster than iPhone 4. - Mike Capps from Epic Games on stage for demo. Showing off Infinity Blade 2. - Phil back on stage. iPhone 4S battery has 8 hours of 3G talk time, 6 hours 3G browsing. - Wireless system updated. Stainless steel band with two antennas, switch intelligently between them. - Data speed twice as fast...14.4 Mbps HSDPA. It's what competitors call 4G. - World phone...both CDMA and GSM in one phone. - New camera system. iPhone 4 is top camera on Flickr. We wanted to make the 4S better than point and shoot. - Eight megapixels...3264x2448. Backside illuminated sensor...73% more light per pixel than iPhone 4. 33% faster capture. Hybrid IR filter, better color accuracy and uniformity. Five element lens, 30% more sharpness, f/2.4 aperture. Face detection, better white balance, and fast photos. - Time to first photo: 1.1 seconds. Half a second for next shot. - Schiller demoing photos taken with iPhone 4S. 1080p HD video recording, video image stabilization, noise reduction. Wrapping up camera discussion. - AirPlay mirroring. Gaming on the TV screen...wired or wireless. - Phil recapping iPhone 4S specs..."entirely new" on the inside. - Most amazing iPhone yet, but Phil left out one thing...all about our voice. - We've long wished devices could really understand us. - Demo time for Siri, the personal assistant. - Scott Forstall on stage for Siri demo. "What is the weather like today?" iPhone answers "Here is the forecast for today..."
- "Wake me up tomorrow at 6am." iPhone sets alarm and confirms. - "How's the NASDAQ doing today". iPhone brings up stock chart. - "Find me a Greek restaurant in Palo Alto." iPhone brings up options. - "Give me directions to Hoover Tower" iPhone brings up map and directions. 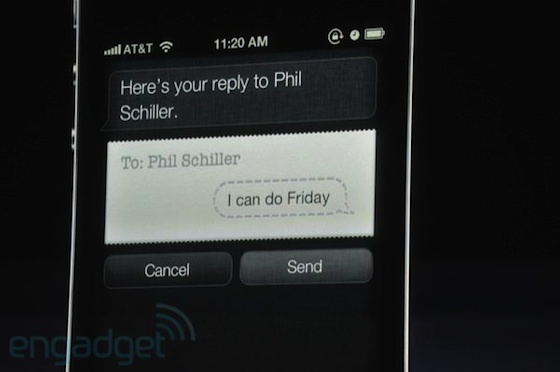 - Siri can read text messages aloud, check appointment calendar, and take down dictated response. - "Remind me to call my wife when I leave work." iPhone sets up a geofence to alert Scott when he leaves the campus. - "Search Wikipedia for Neil Armstrong." Info page pops up. - "Define 'mitosis'." iPhone checks WolframAlpha. Same for currency conversions. - Siri includes lists of example requests to help users learn. - Phil Schiller back on stage. Showing off dictation capabilities in Mail. Works out of the box, but improves as it learns your voice. - Works in English (US, UK, Australia), French, and German. Beta to start, with more languages and services coming. - Recapping the iPhone 4S, and now showing a video. 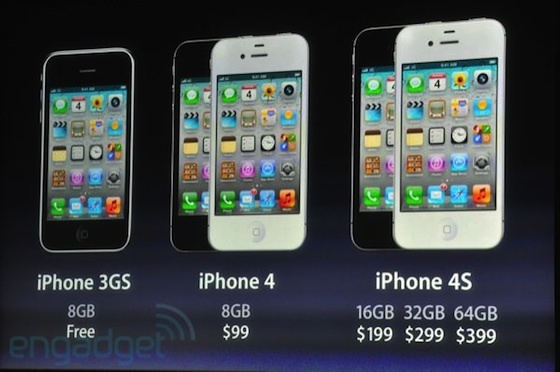 - iPhone 4S pricing: $199 16 GB, $299 32 GB, $399, 64 GB, with contract. Black and white versions available. - 8 GB iPhone 4 at $99, 8 GB iPhone 3GS free. - Preorders for iPhone 4S start this Friday, October 7th. Launches in U.S., Canada, Australia, France, Germany, and Japan on October 14th. 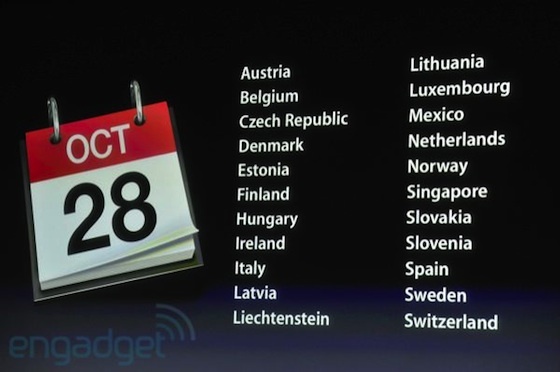 AT&T, Verizon, and Sprint in the U.S.
- 22 more countries on October 28th, and 70 by the end of the year. - Tim Cook back on stage to wrap up. - "These products are great and fantastic and industry-leading. But what puts Apple way out in front is how they work so well together. I'm so proud of this company and all of the teams who have brought you the innovations you've seen today." - Event over. Media headed for hands-on time. A new iPhone is coming out? Why didn't anyone tell me? Anyone want to buy an iPhone 5 case...cheap? Gotta love the drama queens. It's actually very funny to see people taking it so personally. Should I upgrade now or wait for iPhone5? To iPhone 5 case makers: U MAD? I wanted to say, like usual, thank you MacRumors for covering the events each time. It's always fun for everyone here, and I speak for many when I say it is much appreciated.